We’ve run a couple of extended articles of Stu Gibson’s photos in PLB over the years, generally featuring his mates messing around on longboards in friendly waves around his home turf in Tasmania. Stu’s an old school tech-head photographer, but also a real adventurer who’s main calling is shooting big stuff, in particular Shipsterns from the water. 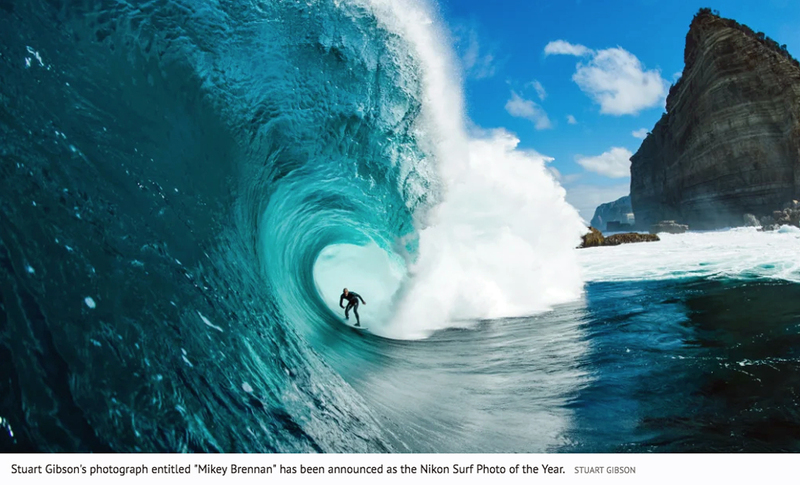 He’s been at it since surfers first started venturing out there and deservedly has a huge rep for capturing that beast, and it’s particularly fitting to seem him score the 2019 Nikon Surf Photo of the Year. And what a shot! For some photographers, it takes a lifetime to capture the perfect shot, but for Stuart Gibson, half an hour and some sunshine was all he needed. Announced as the 2019 Nikon Surf Photo of the Year on Tuesday night, the Tasmania-born photographer says his winning shot Mikey Brennan was simply the result of good timing. "We were shooting out with a drone, and the sun came out so I quickly jumped in the water with my camera," he said. "Thirty minutes later it suddenly went really cold and ugly again." Shot on the south-eastern coast of Tasmania at Shipstern Bluff, Mr Gibson says the iconic surfing spot is one of his favourite places to photograph. "I am pretty familiar with the place," he said. "The light is really nice; being from Tassie we don't get to see that blue very often." The winner was selected by a panel of 13 people within the surfing industry, including seven-time world champion Stephanie Gilmore. "As a photographer myself, I could see the passion and commitment to the craft in so many of the images," she said. Photographer Jan Wainwright-Wilson was a standout as the only female entry among 20 finalists, with a photo of Mick Fanning in his final world championship tour. The award recognises the best single surfing-themed image taken last year by an Australian photographer, with the winner selected based on effect, sensory impact, creativity, innovation and composition. Surfing film Octopus Video No. 4 by Chippa Wilson was announced as the Nikon Surf Video of the Year.